Home » Aural vs. Oral: What’s the Difference? In English, words that sound the same but mean different things are called homophones. English has many homophones, and they all have the potential to confuse someone who might not recognize the difference. The words aural and oral are technically near homophones, rather than true homophones. Nonetheless, when not pronounced clearly, they can sound identical. Since aural and oral refer to different sensory faculties, it’s important to use them correctly, so you can avoid a potentially embarrassing mistake. In this post, I will compare aural vs. oral. I will use each word in a sentence to illustrate its proper context, and I will explain a helpful trick to use when you can’t decide whether to choose oral or aural for your own writing. What does aural mean? Aural is an adjective that means related to ears or the sense of hearing. In the following sentence, aural and auditory could be used interchangeably. The patient listened to music as auditory stimulation during rehab sessions. The patient listened to music as aural stimulation during rehab sessions. Since the music stimulated the patient’s ears, aural is appropriate. Music is a form of sound, so auditory also fits. In the next sentence, only aural is correct. The patient received cochlear implants to assist in aural functioning. This time, the sentence refers to the functioning of the ears themselves, so auditory would be an imprecise choice of words. Only aural is correct. What does oral mean? Oral is also an adjective. It means related to the mouth. Tania has excellent oral hygiene. My doctor’s notes say this pill is an oral medication, and should be taken twice daily by mouth. We are a proud people, with a rich oral history and many festive traditions. I had to correctly pronounce many words in order to pass my oral French test. It’s easy to remember whether oral or aural is correct, and here is a helpful trick to remember oral vs. aural. Oral refers to the mouth or speech. 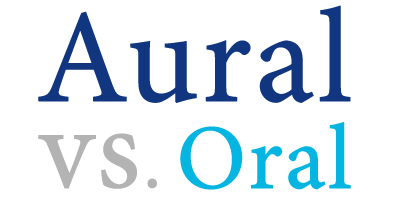 Both oral and mouth are spelled with an O.
Aural refers to the ears. Neither aural nor ears contains an O. Keeping these words straight is as simple as remembering how each is spelled. Since both of these words are used in connection to the senses we use every day, it’s easy to get them mixed up. You can remember which is which by thinking about how these words are spelled. Always remember that you can check this website any time you need to refresh your memory. 1 What is the Difference Between Aural and Oral? Always vs. All Ways: What’s the Difference?